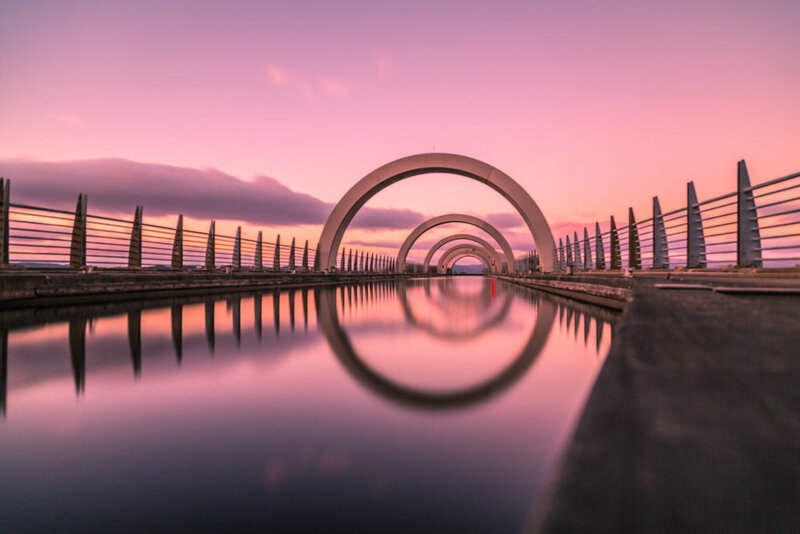 The Falkirk Wheel is a rotating boat lift in Scotland, connecting the Forth and Clyde Canal with the Union Canal. The lift is named after the town it resides in of Falkirk in central Scotland. It opened in 2002, reconnecting the two canals for the first time since the 1933. Before the Forth & Clyde and Union canals were connected by a staircase of 11 locks which took nearly a day to transit. The design is claimed to have been inspired by a Celtic double headed spear. Work started on the project in 1998 at a cost of £84.5 million. The plan to regenerate central Scotland's canals and reconnect Glasgow with Edinburgh was led by British Waterways with support and funding from seven local authorities, the Scottish Enterprise Network, the European Regional Development Fund, and the Millennium Commission. Planners decided early on to create a dramatic 21st-century landmark structure to reconnect the canals, instead of simply recreating the historic lock flight.